SERVICE ABOVE SELF. We congratulate long-serving Board members, Terry Nobbs and Rod Hoggard on the award of Paul Harris Fellowships by Rotary District 9910 recognising their contribution to seafarers’ welfare over many years (Terry – 20+, Rod 40). February 2011 – Obituary: Long Serving Sailors’ Society Board Member, Cdr Viv Kempthorne. We record, with regret, the death of Commander Viv Kempthorne OBE RNZN (Rtd) at the age of 92. On retirement from a successful career in the Royal New Zealand Navy Viv joined the Board of what was then the British Sailors Society, and served for many years in various capacities including as President. He retired from the Board about 15 years ago but maintained a keen interest in the Society and its work. We extend, to Viv’s family, our sincere condolences and we offer our heartfelt thanks to God for the contribution that Viv made to the work of the Sailors Society. In early June, Auckland police picked up a group of men found sleeping rough on the streets in bitterly cold weather. None of them spoke English, and were taken to the Auckland Central Police Station and checked in as vagrants. After a night in the cells and realising that the group were seafarers local Maritime Union of New Zealand (MUNZ) officials were called in to help. 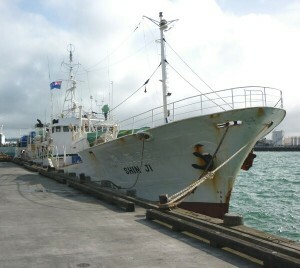 The 11 men proved to be Indonesian sailors from the Korean fishing vessel, SHIN JI (formerly King Fook 88). Police and the union officials took the seafarers to the Auckland International Seafarers Centre in Quay Street. There they were given tea, coffee and food while they met with immigration officials, representatives of the joint venture fishing company and the local inspector for the International Transport Workers’ Federation (ITF), Grahame McLaren. McLaren had abandoned leading a training course in Tauranga to head to Auckland to assist in the negotiations as soon as he heard of their plight. The men resolutely refused to return to their vessel alleging bullying and poor treatment by its Korean officers, salt water showers which were limited to one per week, no hot water and no pay for 4 months. The Seafarers’ Centre is run as a partnership by Auckland’s three main seafarers’ welfare groups. The Sailors’ Society chairman, Terry Nobbs, was on duty when the group arrived and assisted in their care. ITF Inspector McLaren subsequently visited the vessel to check out the crew’s allegations. He noted that it was in a generally untidy and poorly maintained condition, with fishing gear blocking access to the liferaft on the upper deck. He found however, that the vessel appeared to be well provisioned. At the ITF Inspector’s insistence, the sailors were accommodated by the charterers, Tu’ere Fishing Ltd of Christchurch, in a North Shore motel for two days while discussions were concluded. Arrangements were made to pay the crew and arrange their return flights to Indonesia. Under ITF supervision a little over $50,000 was finally paid to the men, who left Auckland a couple of days after their walk-off protest had commenced, pleased to return home and obviously pleased with the resolution of their concerns. An ITF representative met the men on arrival at Jakarta to ensure they got safely to their homes. However,when contacted by Professional Skipper, Nobbs appeared to be less impressed by the New Zealand charterers of the vessel who, he said, seemed to be more concerned about getting the vessel back to sea than the concerns of the seafarers.